DML has been hitting the inner rings with their recent releases, and their new DV (early production) M4 kits have been both well done and well received. 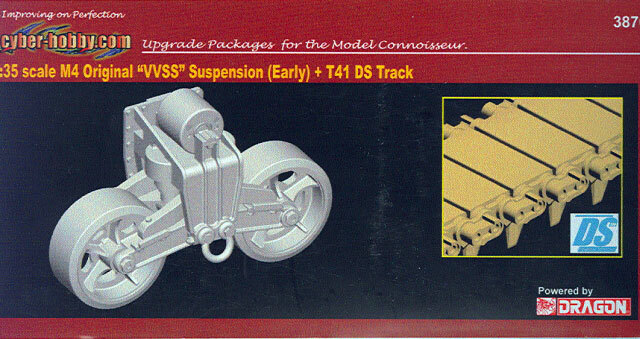 Now DML’s affiliate cyber-hobby.com has released an “upgrade” kit of their new suspension and tracks as a separate kit for use with either modeling projects or upgrading older kits. The kit provides one of the earlier variations of the VVSS suspension with the “smooth” finished bogie carriers (another kit offers the versions with lateral ribbing, according to the advertising broadsides), return rollers, five-spoked welded wheels, and welded idlers; no drivers are included with this set. A set of hull adapter plates are provided to fit them to either any DML or Italeri hull, or with trimming to any other manufacturer’s M3 or M4 hull. The very nice early war T41 tracks are included – these being non-reversible rubber pad tracks – from DS plastic, and most modelers have been relatively enthusiastic about them as single link US medium tank tracks made from three to five parts per link are exceedingly tedious to assemble, and as the medium tanks used “live” tracks which rarely sagged of little advantage. This set permits upgrading older kits such as Tamiya M3 and M4 Early kits as well as Academy M3 kits (if you did not get the “upgrade” sprue from Academy with the correct size bogie carriers). Detail is good, and the set costs less than half of the Tasca set with relatively identical details, plus the T41 tracks as a bonus. Overall this set is very good value indeed and should help get some older kits and projects off modelers’ shelves!